Frederic William Goudy – born 8. 3. 1865 in Bloomington, USA, died 11. 5. 1947 in Malborough-on-Hudson, USA – type designer, typographer, publisher, teacher. 1888: book-keeper for credit and mortgage companies. 1889: moves to Chicago, works in real estate. 1892: launches "Modern Advertising" magazine which issues only a few numbers. 1895: opens a print workshop in Chicago and prints the "American Chap-Book". 1897: designs his first type, Camelot Old Style. Produces typographical designs for various publishing houses and companies. 1903: founds the Village Press. The first publication is an essay by William Morris. 1904: his publications are awarded prizes at the world exhibition in St. Louis. 1908: the Village Press is destroyed by fire. 1909–24: the Press is reopened and run under Goudy’s management in Forest Hills. 1914: signs a contract with the American Type Founders Company governing the manufacture and use of his typefaces. 1916: sells 8 new typefaces to the Caslon type foundry in London. Numerous companies commission Goudy™ to design exclusive typefaces for them. 1920–40: art consultant to the Lanston Monotype Co. 1924: he and his publishing house move to Marlborough-on-Hudson. 1925: opens his own type foundry. 1939: the workshop for type design, type cutting, type foundry, typesetting, printing and bookbinding are destroyed by fire. 1940: teaching post for calligraphy at the University of Syracuse. 1947: the Goudyana exhibition is opened in Goudy’s presence at the Library of Congress in Washington. Goudy designed a total of 116 fonts and published 59 literary works. Fonts include: Copperplate (1905), Kennerley (1911), Goudy™ Old Style (1915), Deepdene (1927), Remington Typewriter (1929), Californian (1938), Bulmer (1939). Publications include: "Typologia. Studies in type design and type making", Berkeley 1940; "A half-century of type design and typography, 1895–1945" (2 vols. ), New York 1946. 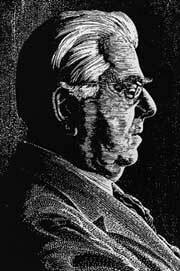 D. J. R. Bruckner "Frederic Goudy", New York 1990.